In the spirit of Flashman and in the inimitable George MacDonald Fraser style comes a rousing story of prize fighting in the 19th century. Reissued in a stunning new package, Black Ajax will attract a new generation of fans. When Captain Buck Flashman sees the black boxer catch a fly in mid-flight he realizes that he is in the presence of speed such as the prize ring has never seen. Tom Molineaux may be crude and untutored, but if `Mad Buck' knows anything (and like his notorious son, the archcad Harry Flashman, he has an unerring eye for the main chance), this ex-slave from America is a Champion in the making, on whose broad shoulders the ambitious Captain can climb to sporting and social fame. 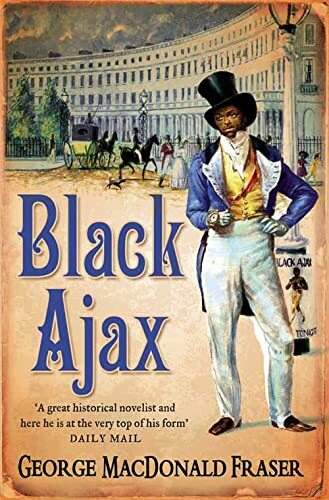 Under his patronage, the `Black Ajax' is carried on a popular tide of sporting fever to his great dream: to fight the invincible, undefeated Champion of England, the great Tom Cribb. The story of Molineaux and his eventual battles with Cribb is told through a series of superbly original and individual voices - colourful, powerful and funny. Together they create a magnificent picture of Regency England and a portrait of a flawed hero who surmounted the barriers of ignorance, poverty and race hatred to bring the prize ring a lustre it had never known before, and may never again.